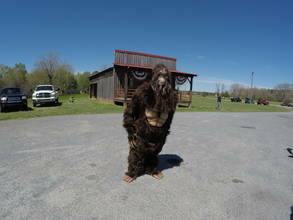 Description: Big Foot Rides Again - 4th Annual Uwharrie Mountain Rumble is a Charity Motorcycle Ride to raise funds for the Oxford Orphanage, White Stone Retirement Home and the Masonic Foundation. The Charity Ride started in Mt. Gilead, NC and rode through the country side to Eldorado Outpost and back to Mt. Gilead. Over 90 motorcycles took part in the charity ride. - Videos of travel and events using a DJI Phantom 4 Drone, GoPro and small camcorder. - The full video is on my YouTube Channel at http://tinyurl.com/WhiteEagleVideos Please, Like - Share and Subscribe to the YouTube Channel. Thanks !! !